Science Daily: University of Oregon chemists studying the structure of ligand-stabilized gold nanoparticles have captured fundamental new insights about their stability. Phys.org: A team of researchers from Carnegie Mellon University and the University of Oregon has used melanin as an ingredient in a cocktail that led to the creation of a biodegradable battery anode. The Almagest: Researchers at Oregon State University and the University of Oregon today announced a scientific advance that has eluded researchers for more than 100 years -- a platform to fully study and understand the aqueous chemistry of aluminum, one of the world’s most important metals. The Register-Guard: The University of Oregon’s Comics & Cartoon Studies program has received an anonymous donation that will enable it to establish a $200,000 endowment. The money will be used to bring creators, teachers, publishers and other professionals from the world of comics to the UO campus. The Oregonian: UO to establish UNESCO Institute for Intercultural Dialogue and Conflict-Sensitive Reporting to further the mission of building a global community through education and dialogue. The Oregonian: In the summer of 2013, the UO launched a new Study Abroad program called “Nature & Culture: Multimedia Storytelling in Uruguay,” which brings 8 SOJC students on a month long experience in the rustic country of Uruguay. AroundtheO: The University of Oregon has been rated as one of the 100 best values in public colleges and universities for 2014 by Kiplinger's Personal Finance Magazine. AroundtheO: President Michael Gottfredson and Vice President for Enrollment Management Roger Thompson were thrilled at the remarks made by Secretary of Education Arne Duncan praising the University of Oregon’s PathwayOregon program. UO News: The Museum of Natural and Cultural History at the University of Oregon will host "The Gift of Storytelling" — its 12th annual Winter Solstice Celebration — on Friday, Dec. 13. The event will run from 5 p.m. to 8 p.m. at the museum, 1680 E. 15th Ave., near Hayward Field. Admission is free with a non-perishable food donation. AroundtheO: Starting this month, the University of Oregon will offer training to faculty and staff on how to perform hands-only CPR. Although the class does not offer a certification, participants will gain skills that can make a difference. 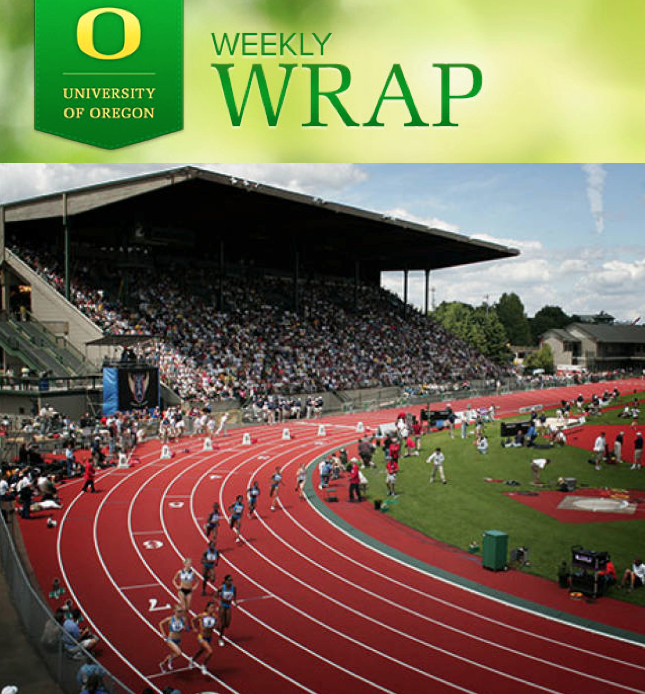 The first training is scheduled for Tuesday, Dec. 17, from 3 p.m. to 4 p.m.
GoDucks.com: The University of Oregon’s Historic Hayward Field will be the home of the NCAA Track and Field Championships for each of the next eight years. GoDucks.com: The junior reporter contest for the 2013-14 women’s basketball conference season seeks youth reporters, ages 5-12, who will be selected to interview Oregon women’s basketball team members after select Pac-12 home games. Daily Emerald: A video of students taking their fun too far may have gone viral, but here are 10 awesome things that also happened during this Friday’s snowfall.